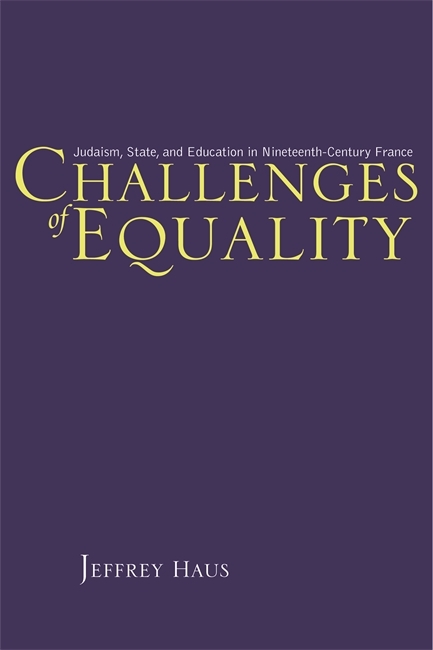 Challenges of Equality is a solid history of the financial relationship between the French State and the Jews of nineteenth-century France and reveals the dexterity of communal leaders in reformulating their positions in response to the challenges posed by emancipation and the church-state issue. Historians have typically characterized nineteenth-century French Jewry as largely eager to assimilate, or, at the very least, passively accommodating to assimilation, with only the most traditional Jews rejecting the trappings of French culture. Through the lens of Jewish primary and rabbinical education, author Jeffrey Haus shows that even integrated French Jews sought to set limits on assimilation and struggled to preserve a sense of Jewish distinctiveness in France. Challenges of Equality argues that Jewish leaders couched their views in terms that the government could understand and accept, portraying a Judaism consistent with the goal of cultural and political unification of the French nation. At the same time, their educational activities asserted the existence of distinctively Jewish cultural space. Haus shows how French government officials repeatedly used political and financial pressure to advance their own vision of an integrated French Judaism. In response, Jewish leaders focused on the concepts of "utility" and "equality" to erect and manage the boundaries between their institutions and the state, as these were key elements of governmental policy toward religious and educational establishments. Haus examines these issues by comparing the financial and curricular histories of Jewish primary schools run by the Consistory and the central French rabbinical school. Utilizing a variety of sources—including school curricula, rabbinical ordination examinations, government documents and correspondence, state jurisprudential decisions, and the French Jewish press—Challenges of Equality paints a picture of a resilient and persistent French Judaism that adapted, integrated, but nevertheless survived. Scholars of Jewish history, French history, European history, and the history of education will appreciate the detailed look at Jewish integration in France that Haus provides. Jeffrey Haus is assistant professor of history and religion and director of Jewish studies at Kalamazoo College. Pressing lacunae in French Jewish historiography have finally been addressed. In this meticulously researched and eloquently argued study, Jeffrey Haus reveals the debates, dialogues, struggles, and unintended consequences surrounding the issue of Jewish education in France, thereby providing a new and timely perspective on French Jewish identity and the relationship between Judaism and the state." Built on solid archival research, Challenges of Equality asks us to look at French Jewish modernization with new eyes. Jeffrey Haus breaks new ground here by focusing on finances rather than ideology. The resulting account is a rich one that tells us much about how, exactly, state support for Judaism was negotiated; in so doing, it also forces us to rethink our inherited notions about Jewish assimilation." Challenges of Equality raises questions important to students of modern Jewry and French history and contributes to a growing literature on the development of French Jewry and the changing meanings of citizenship and equality in France." By showing the financial concerns undergirding Jewish educational choices in nineteenth-century France, Challenges of Equality emphasizes a largely overlooked component of European Jewish history. While not dismissing the role of ideology and culture in shaping Jewish choices, Haus reminds us of the importance of practicality and political negotiation in shaping Jewish institutional development." Challenges of Equality is a solid history of the financial relationship between the French State and the Jews of nineteenth-century France and reveals the dexterity of communal leaders in reformulating their positions in response to the challenges posed by emancipation and the church-state issue." Jeffrey Haus's book represents a valuable contribution to the history of the Jews in nineteenth-century France. In this solidly researched monograph, Haus is not only attentive to the nitty-gritty details of budget and finance, but he utilizes this data to elucidate broader issues facing modern French Jews. This book advances our understanding of Jewish policy making, of the changing boundaries between Jewish and civic space, and of the evolving relationship of Jews and the state."